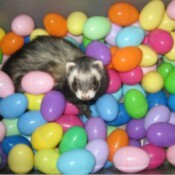 Ferret Play PitTake a storage container, the kind you can slide under a bed (not to do that but easier access for your ferrets) buy plastic Easter eggs, also can be found at garage sales very cheaply or go to dollar tree, even wait till after Easter. Peanut (Squirrel)Peanut is a 3 week old squirrel. 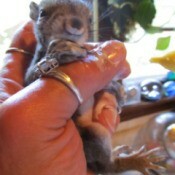 I have rescued three squirrels this summer, two at one time and one alone. This is Peanut, his eyes were closed and he was near death. He became my child and slept with me. 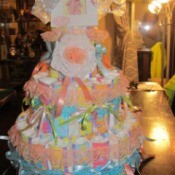 Blues Clues Diaper Cake84 Blues Clues diapers were used for this cake, with small clear rubber bands and an empty paper towel tube filled with 3 diapers.